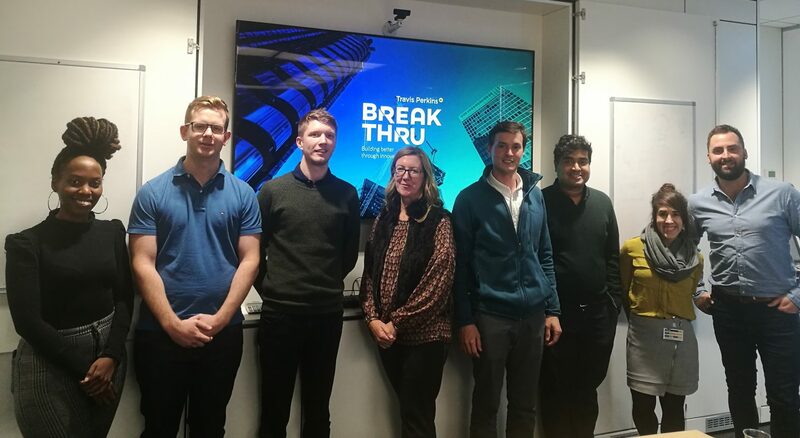 After a competitive application process, Travis Perkins have selected three tech startups for BreakThru, its accelerator programme run in association with innovation partner L Marks. The finalists will spend 11 weeks working with the company, developing their ideas while gaining invaluable access to Travis Perkins’ resources, as well as industry-leading insight from specialist mentors. At the end of the 11-week programme, each team will have an opportunity to seal a commercial agreement and potentially receive financial investment in their business. SpecifiedBy, who provide an online marketplace for construction products and materials, which streamlines the search, comparison and pricing process, helping architects & specifiers to make fast, efficient and better informed specification decisions. Soter Analytics, who have developed wearable sensors and AI to help industrial workers and their organizations avoid injuries in the workplace. The first application of their AI is the SoterSpine, which coaches workers to reduce hazardous movements that result in musculoskeletal injuries by up to 70%. The solution was designed with the worker as the primary focus and have received positive ratings from 96% of users. CarTap, who are on a mission to make last mile delivery more convenient and less polluting – by delivering goods/services direct to vehicles. By removing the need for customers to be at home during a delivery, we enable more efficient dark-hour deliveries and reduce peak traffic. We have received support from Innovate UK, the UK’s innovation agency, and we use software, hardware and the cloud to offer a seamless and secure solution. These companies were chosen from over 80 start-ups across Europe, Asia, North America and Australia who submitted their proposals to Travis Perkins in August.